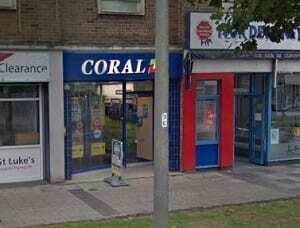 On this page, you can find local information regarding the Coral betting shop on Cornwall Street in Plymouth. We have the contact details for this branch as well as a handy map and the latest offers from this brand. 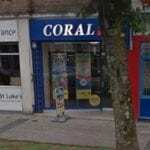 Below is a map showing where the Coral bookmakers are located in Plymouth so you can easily find it if you want to bet on the current sporting events. Here you can see some photos of the shop which is located on a high street close to lots of other popular shops and amenities in the city. 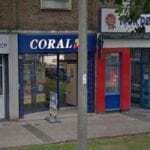 Click here to see all the different Coral bookmakers in the UK at various locations. We don’t have the full opening times for this particular store but it is open 7 days a week for you to visit and bet on various sporting events. If you’d prefer to bet on your mobile or computer, check out our cricket betting sites or visit this page to find the best offers for betting on tennis matches. 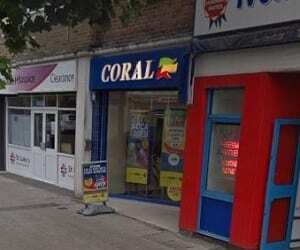 If you need to find out more about opening hours for this Coral branch we would recommend contacting them directly to find out when it opens. 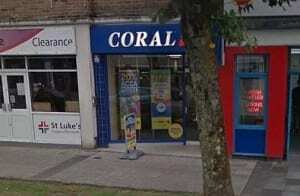 Coral Racing Ltd is a licensed Betting Shop located at 97 Cornwall Street in PLYMOUTH PL1 1NX. The license status: Grant by Plymouth City Council as at 17/09/2010. Plymouth is a city situated on the south coast of Devon, England, approximately 37 miles (60 km) south-west of Exeter and 190 miles (310 km) west-south-west of London. Enclosing the city are the mouths of the river Plym and river Tamar, which are naturally incorporated into Plymouth Sound to form a boundary with Cornwall. Plymouth’s early history extends to the Bronze Age, when a first settlement emerged at Mount Batten. This settlement continued as a trading post for the Roman Empire, until it was surpassed by the more prosperous village of Sutton founded in the ninth century, now called Plymouth. In 1620, the Pilgrim Fathers departed Plymouth for the New World and established Plymouth Colony, the second English settlement in what is now the United States of America. During the English Civil War, the town was held by the Parliamentarians and was besieged between 1642 and 1646. Throughout the Industrial Revolution, Plymouth grew as a commercial shipping port, handling imports and passengers from the Americas, and exporting local minerals (tin, copper, lime, china clay and arsenic). The neighbouring town of Devonport became a strategic Royal Naval shipbuilding and dockyard town. In 1914 three neighbouring independent towns, viz., the county borough of Plymouth, the county borough of Devonport, and the urban district of East Stonehouse were merged to form a single County Borough. The combined town took the name of Plymouth which, in 1928, achieved city status. The city’s naval importance later led to its being targeted by the German military and partially destroyed by bombing during World War II, an act known as the Plymouth Blitz. After the war the city centre was completely rebuilt and subsequent expansion led to the incorporation of Plympton and Plymstock along with other outlying suburbs in 1967. Plymouth is home to Plymouth Argyle F.C., who play in the third tier of English football league known as Football League One. The team’s home ground is called Home Park and is located in Central Park. It links itself with the group of English non-conformists that left Plymouth for the New World in 1620: its nickname is “The Pilgrims”. The city also has three Non-League football clubs; Plymouth Parkway who play at Bolitho Park, Elburton Villa who play at Haye Road and Plymstock United who play at Dean Cross. Plymouth Parkway were recently promoted to the Western League from the South West Peninsula League, whilst Elburton Villa and Plymstock United continue to compete in the South West Peninsula League. Other sports clubs include Plymouth Albion R.F.C. and the Plymouth Raiders basketball club. Plymouth Albion Rugby Football Club is a rugby union club that was founded in 1875 and are currently competing in the third tier of Professional English Rugby. They play at the Brickfields. Plymouth Raiders play in the British Basketball League – the top tier of British basketball. If you want to bet on basketball, please click here to find out about the types of bets first. They play at the Plymouth Pavilions entertainment arena and were founded in 1983. Plymouth cricket club was formed in 1843, the current 1st XI play in the Devon Premier League. 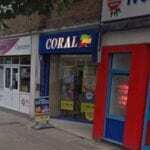 Many fans like to use Coral when betting on these sports either online or in their local shop. Plymouth Devils are a speedway team in the British National League,. Plymouth was home to an American football club, the Plymouth Admirals until 2010. Plymouth is also home to Plymouth Marjons Hockey Club, with their 1st XI playing in the National League last season.